Preheat oven to 200°C (400°F). Place the sweet potato on a baking tray, drizzle with oil and sprinkle with salt and pepper. Roast for 30–35 minutes or until golden. While the sweet potato is cooking, place the breadcrumbs, parsley, butter, salt and pepper in a bowl and mix to combine. 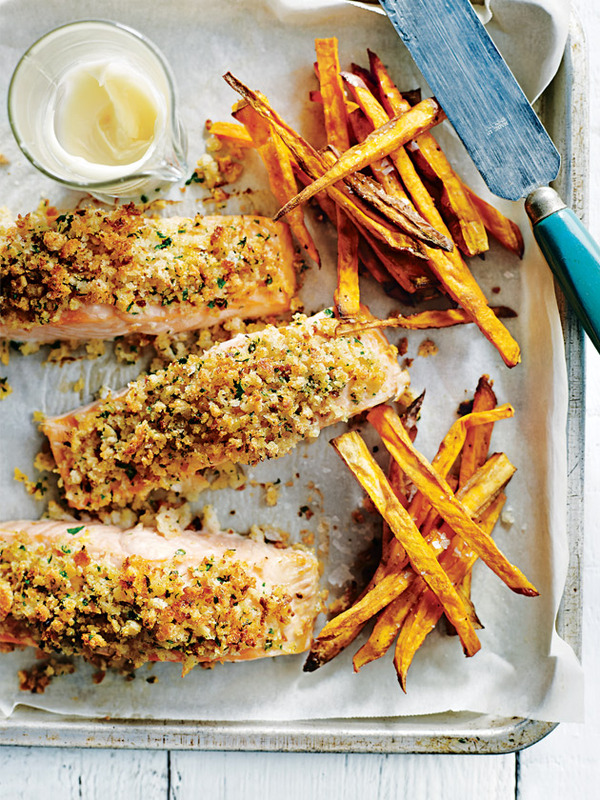 Place the salmon on a baking tray lined with non-stick baking paper, top with the breadcrumb mixture and bake for 12–15 minutes or until golden and cooked to your liking. Serve with the sweet potato chips and mayonnaise. Serves 4. To spice it up: add finely grated lemon rind and dried chilli flakes to the breadcrumbs. Hello, Jo. Thanks for your question. No, unfortunately it wouldn’t be the best, as there is a crumb on the salmon. You might find that it will be hard to get off the barbecue plate without the crumb falling off. The DH Team. Is this recipe suitable to cook on the BBQ? Delicious, healthy and quick dinner. I substituted breadcrumbs for Yankee (Japanese) breadcrumbs and was very pleased with the result. Thanks Donna, you make me look good!